Fannypack recently informed me of this little place in Chinatown that has Buck-a-Shuck happy hour…and get this…it REALLY is a buck for a shuck!!! Not $1.75, not $1.50, just $1!!! When I heard of this, I quickly scurried Hitman to the magical Oyster eXpress with me. This corner restaurant has a very rustic log house interior…the birch color scheme a la Ikea is very pleasing to the eyes and brings a warmth…especially on a night like tonight when it was a huge downpour. 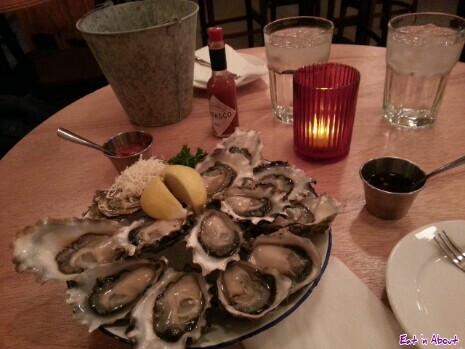 Their Buck-a-Shuck deal is only during Happy Hour Tuesdays to Fridays from 3pm-6pm. We arrived at around 5:15pm and were the only ones here on a Tuesday night. A few more patrons came in afterwards though. We were warmly greeted and seated immediately. Then we were informed of the happy hour (which we already knew about). 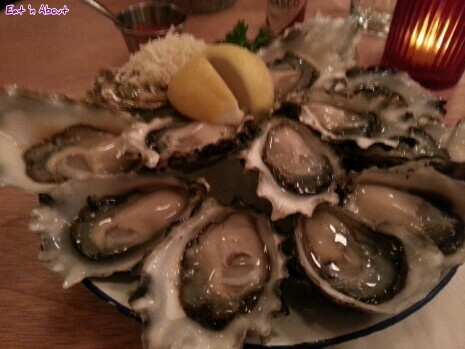 The buck-a-shuck oysters of the day were the Summer Breezes…small but meaty, and from just north of Fanny Bay. Once Hitman heard of that he got intrigued and fired off a number of questions…none of which I really remember honestly =P since I couldn’t wait to order. Hitman’s from the island you see, and he knew some people that either worked or owned oyster farms there. Anyways, we got 2 dozen of the Summer Breezes. It came on ice with shaved horseradish and fresh lemon, red wine mignonette, Tabasco sauce, and a yummy cocktail sauce. 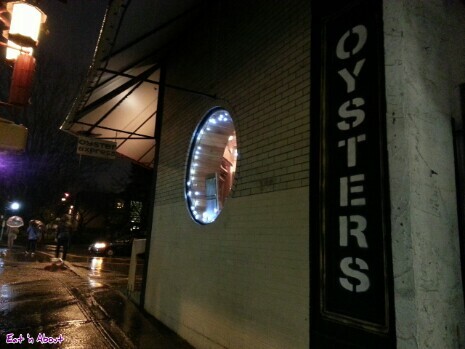 Now neither of us are oyster connoisseurs, but I truly loved these. I had some without adding any condiments except for a squeeze of lemon, and they were so fresh and crisp. The brine was just salty enough to give the gems flavor and they leave a slightly sweet aftertaste. I also had some with a sprinkle of the horseradish and cocktail sauce. The horseradish, when eaten by itself, gives the signature brain burn…but with the oysters, it adds just enough kick. With the red wine mignonette it becomes a different experience. It sort of just tastes like a red wine vinaigrette, good, but not my favorite. I think these are best consumed naked. I also got Hitman one of their homemade ginger teas. It’s caffeine-free and was a mix of herbal things and real ginger slices, slightly sweetened. 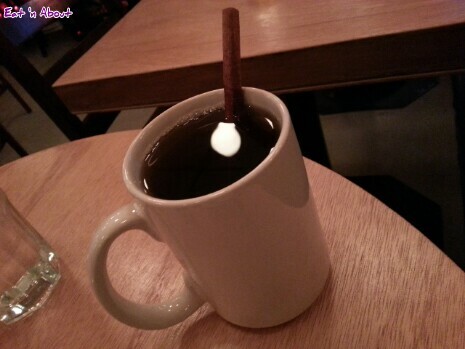 We liked the cinnamon stick stirer. It’s made to order so took about 5 minutes to steep. Overall it was a very wonderful experience. 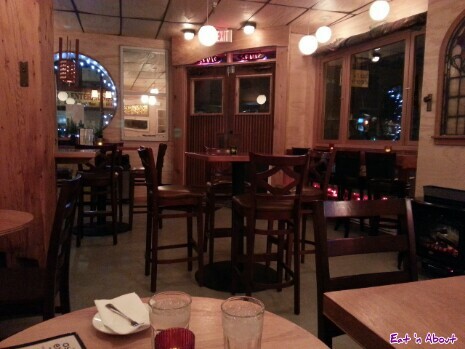 We really liked the ambiance in there. Even though it’s “Express” we did not feel rushed at all. The staff were just attentive enough. I will definitely make a trip back. Next PostDine Out Vancouver 2013!! Sweet 😀 my friend and I are always on the hunt for a buck a shuck places! This place counts neat! 😀 and it’s actually a buck!